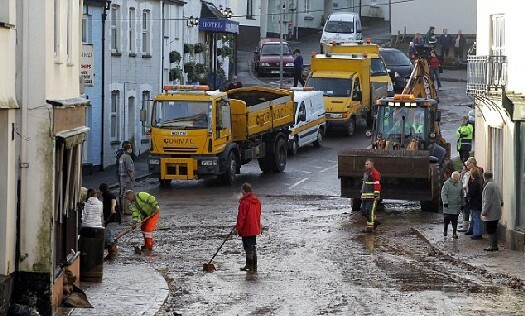 The British Gazette » Cornwall: Floods 17th November, 2010. St. Austell, Lostwithiel (above), Bodmin, Twyardreath, Par, Mevagissey and St. Blazey. These places, well known to the Rogers family have suffered terrible during the early hours of today. The emergency services it appears have done and are continuing to do a grand job. Doubtless there will be those who will suggest that this is yet more evidence of global warming. This is nonsense. As one whose family comes from Cornwall I can tell you that Cornwall gets rain. Lots of it at times. There is in fact an old saying from the neighbouring county Devon: “Devon, Devon, Glorious Devon, where it rains six days out of seven.” This is of course an exaggeration but it makes the point. The British Gazette with thanks to the website (http://www.britishpathe.com/) can present the following evidence. Below is a video showing floods at the end of August 1958. It shows cars running through flooded A39 Launceston, Bude road at Hele Bridge, Stratton. Flooded fields alongside road. Flood damaged wall at Stratton. River Strat 4 feet above normal. ‘Ye Olde Mill Teahouse’ at Coombe Valley showing damaged and collapsed walls. Coombe river and spot where stone bridge was washed away. They may have swapped global warming for climate change but, the flooding is down to the low levels of atmospheric CO2. A problem hastened by the fact that the lunatics of the Energy Department are spending billions of pounds capturing CO2 emissions and burying them. There are 396 CO2 molecules per 1,069,600 molecules of air, 94% of which is water vapour. Of the 396 CO2 molecules only 12 are attributed to the anthropogenic use of fossil fuels. But still the climate change scam continues unabated, forcing up the cost of energy by order of the fraudsters of the UN and bent politicians. Peter, you are showing your age ….we no longer have global warming….the science just does not work you see. No, the latest floods are the result of climate change, yes, that’s better, climate change.